Strength training and yoga may seem like they're on opposite ends of the fitness spectrum. Many yogis—especially women—are apprehensive about strength training because they fear adding bulk or losing mobility. On the other hand, many men who lift regularly will often refuse to step foot in a yoga room for fear of being perceived as a wuss. However, as someone who has trained and taught in both worlds, I can attest that yoga and strength training are essentially two sides of the same coin. This is especially the case with two of my favorite modalities, bodyweight training and kettlebells. The deep-breathing yin of yoga is the perfect counterbalance to the high-tension yang of a kettlebell swing or press, or a bodyweight pull-up or handstand push-up. What if I told you your yoga practice would actually improve if you also trained for strength? The reverse is true, too: Your strength practice can be improved with the addition of yoga. And it doesn't have to be a "today is strength, tomorrow is yoga" relationship, either. You can unite both practices to create a more balanced training regimen! 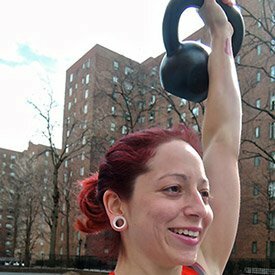 Here's how to do it, focusing on kettlebell work in particular. Yoga comes from a root meaning "to yoke or unite" and aims to align you with your highest nature. The philosophies behind yoga include guidelines to improve your health through breath exercises, posture correction, flexibility, and the strengthening of the mind-body connection. Those are the same reasons many people begin strength training. For instance, with kettlebell work, trainees are often drawn in by the weight's potential to help them move better, build muscle evenly in the body, and improve posture and focus with minimal equipment necessary. 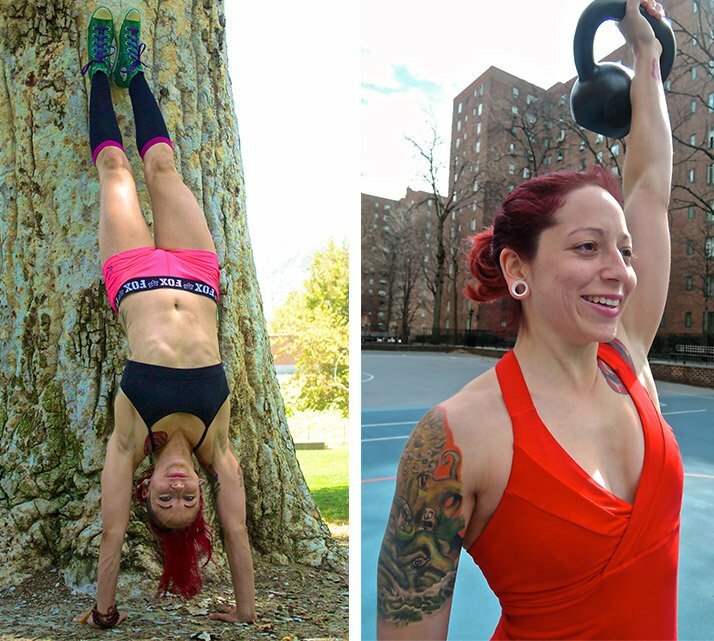 Like yoga, the kettlebell is also an all-star at developing strength, agility, and endurance. In both cases, the benefits extend beyond the gym. The similarities definitely don't end there. Let's break down three postures and three kettlebell-specific movements that complement each other when practiced together. For most people, the swing is where kettlebell training begins. It's a powerful move that can give you plenty of bang for your buck while providing a wide range of important benefits. First and foremost, the swing strengthens your entire posterior chain, allowing you to counter any flexed postural tendencies. It is also a ballistic powerhouse that can make you more explosive and better conditioned for sports ranging from running to martial arts. For instance, I've trained for several long-distance races by practicing nothing but high-volume swings for endurance. The hinge aspect of the swing also shows you how to recruit the bigger muscles in the body like the glutes, hamstrings, and quads in order to load the hips and increase your lifting power. The plank is often taught as a precursor to learning the swing. It teaches you how to get tight at the apex of the swing in order to maximize your power. But what about the hinging motion at the bottom position of the swing—the part where far too many people end up with a rounded spine? I've found that a simple yoga move you're probably familiar with works wonders for teaching this position: downward-facing dog. 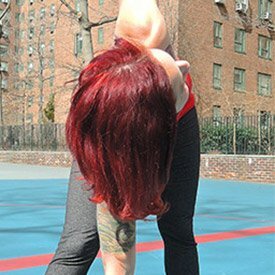 How do I get my heels to the ground in downward dog? Make it your goal; don't expect it to happen by accident! Ease into the pose by walking in place, alternating between bending and straightening your knees. The alternating tension between the hands and the feet while in downward dog causes a deep, even stretch in your spine. Where you feel that tension most tells you a lot about your mobility, or lack thereof. Tight hamstrings can manifest in this pose as an increased rounding in the low back, and tension in the calves and ankles may cause the heels to rise off the floor. Fix these flaws, and you'll find that you have the mobility necessary to perform a solid swing. As you ease into the pose, concentrate on performing deep, diaphragmatic breathing. Keep extending your tailbone upward and expanding your chest and ribcage downward as you press through your hands. Over time, it will become easier to push your head and neck past your arms. Your body should resemble an inverted V-shape with your legs and spine as straight as possible, just like the hinge of the swing. Many people are surprised at how tough a minute of downward dog can be at first. But with time and practice it provides both strength and flexibility benefits throughout the body. Stick with it, and the posture will feel less intense and more like the active-rest position it should be. The triangle pose in yoga is great for strengthening the legs, and stretching your groin, hamstrings, and hips, while opening up your chest and shoulders. The kettlebell windmill is a similar-looking movement that many trainees use to increases lockout strength, shoulder stability, and flexibility under tension. It also strengthens the lower back, hamstrings, abs, and hips. Though there is a lot of carryover between these moves, there are distinctions. First, there is significantly more spinal rotation involved in a windmill than in triangle pose. While both movements are initiated at the hips and require flexibility in a lot of the same muscle groups, specifically the legs, the triangle is pure lateral (side) flexion without much in the way of transverse (rotational) movement. Additionally, the weight of the kettlebell in the windmill changes the upper-body recruitment, requiring increased shoulder stabilization. It's also worth noting that the weight of the kettlebell can deepen the stretch in the hips and hamstrings, similar to having partner assistance in a yoga class. 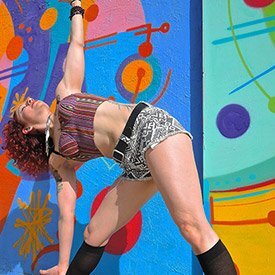 Triangle pose can also help lengthen the lateral side of the body including the obliques, glutes, and the tensor fascia latae (TFL) to aid in better mobility in the windmill. A major challenge in the triangle pose is keeping the spine close to neutral as you bend sideways. The more you focus on extending through the spine, head, neck, and shoulders as you push the hips back, the more core recruitment will be involved. When you retract your shoulder blades and widen your arms, you also increase thoracic flexibility. These aspects of the movement are what make triangle an ideal precursor to the windmill in a hybrid routine. Performing a handstand hold can greatly increase your overhead pressing strength, plain and simple. But as anyone who has ever set an ambitious pressing goal can attest, strength isn't enough. You need mobility, too! And the handstand can work wonders there. Specifically, practicing this movement with wall assistance increases mobility in the often-problematic shoulders and thoracic spine. In most cases, the overhead press is performed incorrectly because of lack of mobility and stability in these muscles, leading to compensation in the form of hyperextension (leaning back excessively) of the lumbar spine. Practicing handstands against a wall and actively pushing your chest forward and minimizing lumbar extension can correct this. Along the way, you'll also boost your lockout strength dramatically. If you are working on the balancing aspect of the pose, handstands will teach you how to engage your abs, lower back, and glutes, much like you need to when locking out a kettlebell press. Make no mistake: Both are full-body movements! The handstand teaches you to stay rigid from head to toe while exerting a significant amount of force overhead. It will also help correct the common bad habit many people have of leaning to the side while pressing overhead. As I wrote in "Handstand Push-ups: The Press You Need to Learn," inversions are hailed as the king of circulatory exercises in yoga, and for good reason. As you spend more time upside down, you'll improve circulation in your upper extremities, relieving the pressure from the lower body that has built up from being on your feet all day. Likewise, a big part of being a successful presser is learning to control your breath. Poor posture can decrease lung power by placing too much pressure on the diaphragm. Your breathing can improve as you flip upside down and stretch out your upper abdomen, helping to increase circulation to the lungs. The better you can breathe while under load, the more strides you will make on all your lifts! Holding postures in yoga allows you to increase mobility throughout the body evenly and naturally as you master the skill of balancing tension and relaxation. This will carry over and improve your strength-training performance. Holding postures in yoga allows you to increase mobility throughout the body evenly and naturally as you master the skill of balancing tension and relaxation. Try the workout below to see for yourself! 10 reps on the minute for 10 min. Grace Kavadlo is a personal trainer, group fitness instructor, fitness model, and blogger.